Well, strawberries are back in season but you'd never know it, here in LA, as it is currently 56 degrees outside and I am literally sitting in front of the fire. Let's call this an experiment, kind of R & D, getting ready for the inevitable summer. Because it will get hot, or even warm, soon. And I like to be well prepared. This drink appealed to me immediately when I read cinnamon bark syrup, (I love making flavored simple syrups! ), mixed with fresh, beautiful strawberries. It's an intriguing juxtaposition of warm and cozy with cool and refreshing. 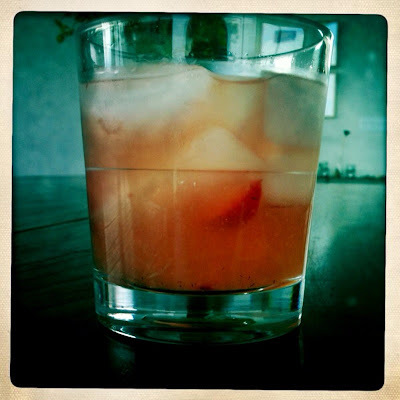 And since it's cold out, (I'm bored), and I happen to have some strawberries and just the right amount of white rum left in the ole alcohol cache, this was a GO and it is now another welcomed addition to my boozey repertoire. You'll love this. In a shaker, muddle strawberry. Add the rest of the ingredients with ice. Shake and strain into a glass filled with ice. Garnish with extra strawberry. Combine all the ingredients in a small sauce pan. Bring to a boil, stirring until sugar dissolves. Reduce heat to a simmer for 5 minutes. Strain and refrigerate until needed. Great looking, it gives me the chills even though it's 30+ celsius here in Lahore.